Wildlife managers often debate issues around, for example, extra-limital distribution of species on game ranches; the selective breeding of commercially valuable genetic “oddities” such as golden gnu, black springbok; genetic contamination; sustainability; high prices paid for selectively bred buffalo, sable etc., etc. Mindful of these issues, a group of South Africa’s first people, Bushmen (as they call themselves) have been implementing their own wildlife management on land restored to them in the Northern Cape. 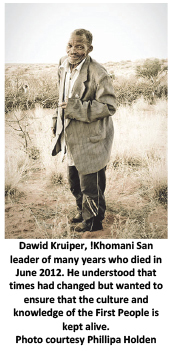 The !Khomani San, under the leadership of the late Dawid Kruiper, obtained some 25,000 ha of land in the Kgalagadi Transfrontier Park, and some 36,000 ha of farmland to the south of the Park, as settlement of a land claim in 1999. Renowned for their tracking skills, the current generation of Bushmen deals with the realities of modernity in a commercial, business-oriented social and economic environment, whilst striving to ensure maintenance and inter-generational transmission of knowledge, custom and tradition.They have voluntarily developed a set of protocols to ensure that their rights to hunt, gather and conduct important cultural/spiritual activities in the National Park are done in a manner that respects their traditions and values as well as the conservation of biodiversity and maintenance of ecological processes. Younger members of the clan accompany elders and healers on plant gathering trips in the Park, and record plant population densities, off-takes and trends via GPS-linked cyber trackers. With the necessary technical support, the Bushmen thereby contribute to ensuring sustainable harvesting of certain plants and animals to mutual benefit of their community and SANParks (as the appointed custodian of public interest). One of the farms, the 6,000 ha “Erin”, has been developed as a commercial game ranch. Entirely managed by members of the community, the ranch has been fenced in accordance with the requirements for a Certificate of Adequate Enclosure, and stocked with locally occurring species including oryx, springbok, red hartebeest and blue wildebeest. The community explicitly chose not to include currently “popular” (and high-value) genetic recessives such as golden gnu, black or white springbok etc. Two water points, with an unused third as backup, are deemed sufficient in this semi-arid region, and no supplementary feeding is provided. The target market are ethical hunters wishing to participate in an “authentic” Kalahari hunting experience, accompanied by skilled trackers who share their lore and knowledge. Each year, the people decide on hunt quotas based on counts (foot counts, supplemented by aerial, funds permitting). Now in the third year of commercial operation, Erin, arguably South Africa’s only game ranch owned and managed by indigenous people, is already showing an annual operational profit. Small, albeit important, successes in the Land Claim saga! In 1995, 160 !Khomani San clan members lead by Dawid Kruiper applied to have their land returned to them and in 1999 they received six farms with a total of 36,000ha outside the Kalahari Gemsbok National Park with a further 25,000ha inside the park. The Khomani San’s ancestral land has been placed on Unesco’s tentative World Heritage Site list. Hunting has been a way of life for the Bushmen for tens of thousands of years, though it is now a dying art as a result of loss of access to traditional hunting grounds, new laws and the loss of culture and traditional way of life. They traditionally hunted with bow and arrow, and spears, giving thanks to the animal’s spirit after it has been killed. Hunting has never been conducted for its own sake, but to feed and nurture the people and provide skin, bone and gut to make clothing and tools. For the Khomani San occupying and developing the land of their ancestors is a highly significant and indeed spiritual event. South African poet Laurens van der Post said, “The bushman personified an aspect of natural man which we all have, but with which we’ve increasingly lost contact…”. It is now possible to undertake hunts with experienced !Khomani San trackers and hunters and engage with them, honor the age old rituals associated with the hunt and experience the ways of the past. Blade Witbooi, Erin’s huntmaster, once a farm laborer on the land now owned by the clan. Modern technology has also entered into the picture: information about plant and animal populations is entered and data is downloaded onto the cyber tracker system. This process creates an interface where inter-generational knowledge and ancient wisdom can be transferred and used through this technology. The information is also used to decide the number of hunts Erin can reasonably host. Ecologists Dr David Grossman and Phillipa Holden van Zyl have provided support and back-up. “We’re in year 15 of a 6-month project,” said David with a smile. To help the !Khomani San develop their land, David and Phillipa sourced funding and contributed their considerable skills to the project. Funders include the WWF Nedbank Green Trust, the National Lottery Fund, Wildlife Ranching South Africa (WRSA), SANParks and Tswalu Kalahari Game Reserve.